Well, it’s been awhile since we posted anything. We haven’t been touring at all, but we’ve been getting the miles in while randonneuring, as well and taking some non-bike(!) holidays. We’ve also been breaking tandems -- more on that later. Since the last blog post, we’ve experienced Californian winter. Compared to the UK it was very short (especially compared to the one that the UK has experienced this year). It started by raining in December, for what seemed like the whole of December. It was heavy, and sometimes accompanied by strong winds. Very few people cycle in the rain here, but as long as it’s not too windy or cold, it was quite pleasant. New Years Eve was spent riding a very fast 200 from Davis (Last Chance Brevet), mostly in company (including a tandem). The route included a large section of the American River Bike Trail. It was lovely and quiet, but you could imagine that the trail would be very busy for much of the year. January arrived with frost, lots of it. Apparently we had the longest cold snap on record for the area. I had thought that we wouldn’t need all our UK winter cycling gear when we moved, but was very glad we brought it with us! We managed another fairly quick 200km brevet from Healdsburg courtesy of the Santa Rosa Cycling Club the weekend before my parents arrived for a three week visit. We spent much of the ride on our own due to setting off without water bottles, and having forgotten to top up the tyre pressure. The main field were long gone by the time we went back to the car to sort everything out. We also managed a first by snapping the drive chain. I’d put a new chain on a couple of days before, and it had initially been skipping, before settling down after about 10km. It was then quite happy until it snapped about 30km from the end. We always carry a chain tool, and spare pins/quick links, so it was a quick repair and sandwich before heading to the brew pub finish location. We didn’t get to do much cycling while my parents were here, but did a fair amount of walking instead. We also spent a week in Canyon Country visiting Red Rock Valley (spectacular colours), Zion Canyon (beautiful waterfalls), Bryce Canyon (amazing views with the orange hoodoos, white snow and blue sky), Monument Valley (very photogenic) and the Grand Canyon (big. very, very big), interspersed with Dam tours, museums and lots of food. Immediately after my parent left, we had another week holiday. This time it was skiing by Lake Tahoe with friends from various parts around the globe. Again, more food was eaten than could really be justified by the exercise. Having completed brevets in both December and January, we were keen to do one in February to keep the run going. With the logistics of holidays and visitors, the only time we could find was the Monday following our return from skiing. 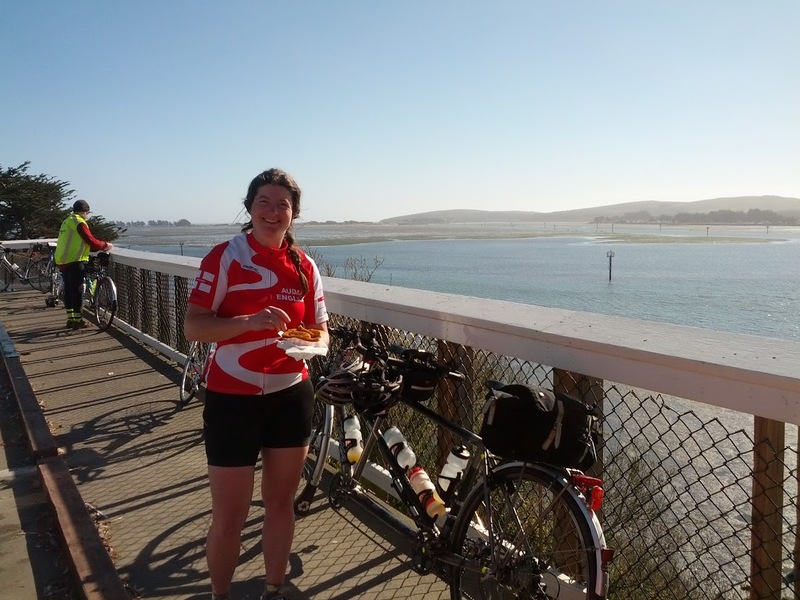 We chose a flat 200km permanent starting in Sunnyvale, meaning we could cycle from home. Having not been on a bike much for a month, it was always going to be a tough ride. The weather (damp), didn’t really help either. Still we managed it, although in contrast to our previous two brevets it was one of the slowest 200km rides we’ve ever done. We’ve also learnt that while a sit down and rest is good for a lunch stop, authentic mexican food probably isn’t the best option for us. March was a much more normal cycling month, with two 300km brevets planned. The first was the San Francisco Randonneurs 300 starting at the iconic Golden Gate Bridge and riding up to Healdsburg before returning via the coast. This had one of the largest fields for a 300 we’ve seen, with 120 entries (and 105 finishers on the day). There were some great headwinds on some of the outbound sections of the ride, which made the tandem popular with riders wanting to draft. Unlike many rides, we were thanked profusely and frequently for the shelter. There was also chatter when conditions allowed, which was nice. Apart from the wind the weather was wonderful. Cycling under blue sky going south along highway 1, with the noise of the Pacific waves crashing in on cliffs and beaches was stunning. Towards the end of the ride, we noticed a creak whenever we stood up for climbing. This sort of sound is normally from a saddle (the combination of titanium railed saddle and a bagman is rarely a silent one), or occasionally the eccentric bottom bracket working loose. A quick check confirmed it was neither of these, so an investigation was booked for the cleaning she was due sometime the following week. As I was cleaning the rear of the bike, I noticed the lacquer on the join between the right chainstay and the chainstay bridge had lifted. After removing the rear mudguard and some of the lacquer to get a closer look, the likely source of the creak was apparent. It was clear that the weld between the chainstay bridge and the the right chainstay had cracked, and then extended into the chainstay top and bottom. Not good. Still, we were planning on getting Kat serviced sometime prior to the 1200km ride planned for June, so we combined stripping the bike for shipping with the maintenance work. Being in the US has made sending it back to Santana a lot easier (and cheaper), than from the UK too, as they’re conveniently based in South California. Typically, I’d discovered the crack just after having posted a $200 cheque for ride entries, including the Davis 300 just over a week away. It was time for Dobbin to come to the rescue. Having seen the elevation profile for the Davis 300, it was clear that we were going to need to lose some of Dobbin’s excess touring weight. Off came the mudguards, racks, etc and the Marathon+ tyres were swapped for some lighter Pacelas. A quick (ha ha!) trip to Pescardero indicated that while we weren’t going to be breaking any records while climbing, we wouldn’t be too slow on the 300. The five minute cycle from the overnight motel to the start of the ride indicated that it was going to be an interesting first stage. There was a very strong wind that would be a headwind or sidewind for around 50km until we reached the shelter of the (up)hills. While we proved it was possible to ride in echelons with a tandem / solo mix, it was hard work! We found a few riders to work with though, which helped quite a bit, but the normally easy going on the flat lands was nowhere in sight. After just over 100km, the first control was very welcome. So welcome in fact that a number of cyclists who weren’t on the brevet turned up thinking that it was their rest stop (which was just next door). The turn around point was at Cobb mountain elementary school at a little over 800m elevation. The rolling hills through pristine vineyard estates and past near derelict ranches showed where the money was being made in the area. One of the more unusual sights was Litto's Hubcap Ranch. The climb to the control started gently, but had some really steep sections. Dobbin has very low gears, and even though we had no touring luggage, we made use of them! At the start of one of the steep sections we were greeted with a strange sight; a randonneuring fixed-gear rider descending at speed and sounding like she was having a lot of fun! It’s always comforting to know that American randonneurs are as mad as their British counterparts. The control was worth the climb, with plenty of food (including freshly cooked pasta). The return leg to Davis started with a very fast descent off the mountain, and all seemed to be going smoothly until we hit the hills around Lake Berryessa when I noticed that the rear wheel was wobbling. A quick stop indicated that the cassette had worked loose, and some play had developed in the hub. We didn’t have cone spanners to hand, but we couldn’t move the lockring without them, so we just tightened the cassette, and carried on keeping a watchfull eye on it. Unfortunately, there was no tailwind to blow us back to Davis once we reached the flat lands, but compared to the morning the going was much easier. We spotted bike tail lights in the distance, about a mile in front, and made them our target. We eventually caught them just before the final info control, and so had a bit of company into the arrivée. Dobbin’s rear wheel took a visit to the bike shop, where we learnt that we’d broken the cassette holder (or more precisely, some of the internals of the cassette holder). This was the second such breakage that the bike shop had seen in a few days. It seems that the Shimano tandem hub (or the cassette holder for it), is becoming known for breaking under high torque. It’s a shame, as in all other aspects it’s bombproof. It was fortunate that we hadn’t got any randonnees booked over the last couple of weeks, as we’d have been tandemless! Instead we’ve had lovely visitors in Joth’s brother and family. We are getting a little bit better known by other randonneurs here, and it’s good to see familiar faces when riding. Next up is the Davis 400km brevet. Fingers crossed that we don’t break anything else on the bike!